Macaulay Samuel Ovuozourie was born on the 25th October, 1960. He hails from Owhelogbo in Isoko North Local Government Area of Delta State. Comrade Macaulay as he is popularly know and called attended Iluelogbo Gammar School, Illuelogbo were he obtained the West African School Certificate – 1979, National Institute for Public Information, Kaduna were he obtained a Certificate in Information in 1982, Institute of Management & Technology, Enugu(UNAIR)1981-1983 and Enugu State University of Science & Technology(Mass Communication) (Ongoing). Others academic qualifications he has obtained includes Ordinary National Diploma in Mass Communication. Before his appointment as a commissioner in Delta State, he worked as Public Enlightenment Assistant with the Federal Department of Information, Junior Editor/Reporter with the defunct Bendel Broadcasting Service, Benin 1983 and Controller, New & Current Affairs, Delta Broadcasting Service, Asaba. He was a labour activist and held many offices in labour union amongs which are Chairmanship of Bendel Television Chapel, Nigerian Union of Journalist, Chairmanship of Bendel Broadcasting Service Chapel, Secretary, Nigerian Union of Journalist, Bendel State, Member NUJ Constitution Conference, Pioneer Chairman, Nigerian Union of Journalist, Delta State, Chairman, Nigeria Labour Congress Delta State Council(1993 – 2003) and Caucus Member, National Executive Council, Nigeria Laour Congress. He was also State Member, Re-Organisation of Political Parties (SDP) 1992-1993. He was Member, Delta State Manpower Development Committee 1996-2003; Member WAI-C Advisory Committee, Delta State 1994 – 1995; Member Poverty Alleviation Committee, Delta State 2000-2003; Director, Lacom Bank Ltd. Lagos 1999 -2003; Led a six man delegation of Nigeria Trade Unionists to study the democratic struggle and role of labour in South Africa, Secretary, General Ibori Vanguard, Co-Ordinator, Delta Manna Foundation Hospital Project, Co-ordinator NLC/Niger-Delta solidarity rallies for Resource Control 2002 – 2003; Member, Committee on alternative political platform which led to the formation of Party for Social Democracy (PSD) 2001-2003; Member, Audit Panel on Delta State Oil Palm Company Ltd (OPC) 1994; Member, Staff Audit Panel SPEB 1995; Founder & Sponsor, Isoko Grassroot Movement (a Political Organisation) 2002; as well as other Isoko Development groups. Macaulay has also had specialized security training in several highbrow institutions in top countries like Israel and the United Kingdom, amongst others. He was the immediate past Commissioner for Power and Energy, Delta state, before his appointment as SSG. Comrade Ovuozourie Macaulay needs no introduction as a Deltan. His bonding with Delta State is akin to the umbilical relationship between a child and the mother right from conception and all through the lifetime. His antecedents and achievements in Delta State speaks volumes. In fact, it has been said in many knowledgeable quarters that the unity, harmony and togetherness which Delta state enjoys today and which has continued to hold the state together as one indivisible, peaceful unit is due greatly to the very huge and unparalleled efforts and contributions of Comrade Macaulay, sometimes at the very risk of his own life, in the turbulent days of crises is some parts of the state. The fact that he was able, by sheer courage, fearlessness and strategic brilliance, to bring peace to the state, remains one of the major legacies of this generation of Deltans to future generations. In fact, if there was a Nigerian version of the Nobel Prize for Peace, then Comrade Ovuozourie Macaulay would have been decorated long ago with the distinguished recognition. He was the first Chairman of the Delta State Council of the Nigeria Union of Journalists (NUJ). He is arguably the first indigenous Chairman of the Nigeria Labour Congress, Delta State. He has been Special Adviser and Commissioner for Special Duties in some of the most challenging portfolios and his sterling and outstanding contributions to the progressive development of Delta state, since creation in 1991, has been a study in the display of selfless service, heroic commitment and courageous conviction, amazing competence and unquestionable dedication and loyalty to his Principal and principles in the face of what has sometimes manifested as unwarranted and selfish opposition. He celebrated his milestone 50th birthday not too long ago and those who knew him from the early days confess that he still carries on with the vigour and dexterity of his activist days and is even now more energetic and exudes an admirable finesse of strategic articulation and visionary acumen which he has brought to bear on his ever demanding schedule of assignments and responsibilities. He is a goal getter and perfectionist, qualities which he will surely bring to bear on this new and very central position. His appointment as the Delta State Secretary to the State Government (SSG), may have come to some as a surprise, in the face of all the rumours that had been flying around. But those who know Comrade Macaulay, will accept the fact if ever ther was one man in Delta State, who richly deserves the position of SSG, then that man is Ovuozuorie Macaulay. The truth of the matter is that Macaulay would just have been as happy to serve Delta State and his governor anywhere he had been delegated to and it is a mark and testimony of his great humility and commitment that he has just as promptly assumed duties as the SSG and even laid down a marker for the staff of the SSG office to be hardworking and focused. 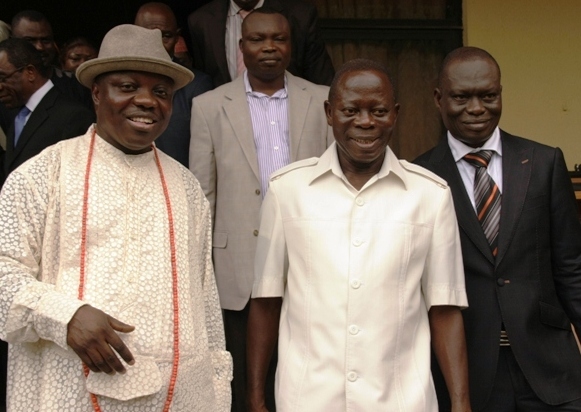 Governor Adams Oshiomhole of Edo State, who was the Special Guest at the Swearing-in ceremony of the new SSG described Macaulay appropriately. Referring to an advice given to him by a Chinese acquaintance, Comrade Oshiomhole said: “The best man to give a sensitive job is one who is both loyal and competent. A loyal staff, who is not competent can be trained to become competent, but a competent staff who is disloyal is dangerous and can even use his competence to work against your interest because disloyalty runs in his blood and is already a part of him. “Comrade Macaulay is a loyal and competent man. I know because I have worked closely with him in the NLC. He was one of the very few Labour leaders who stood by me and believed in our principles of ensuring true democracy in Nigeria in the days when we were regarded as enemies of the military government of the day. 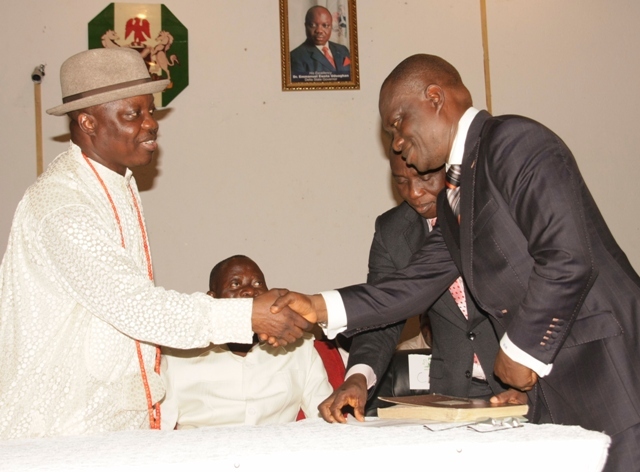 “I thank my brother Governor Uduaghan for his wisdom in appointing a man who has these qualities as his new SSG. He will not disappoint you”. Comrade Ovuozourie Macaulay is happily married to his lovely wife, Stella, herself a well respected Comrade in the NUJ, Delta State Council, where she has served as Secretary in the past, and they are blessed with lovely children. He likes Reading, Travelling and Music. We the youths of Owhelogbo living outside our home town (LAGOS) are proud of you and happy at your appointement as the new DELTA STATE SSG. We hope that the challenges and needs (Unemployment, Insecurity,Constant electricity,Bad roads,No drainages etc.) facing our community will be resolve with the help of your position. I congratulate you sir on your appointment as the SSG, but be reminded that no office last forever. Unemployment has taken the lives of many(that is placed many in state of confusion). Please use your good office to better the lots of your people and Deltans in general.